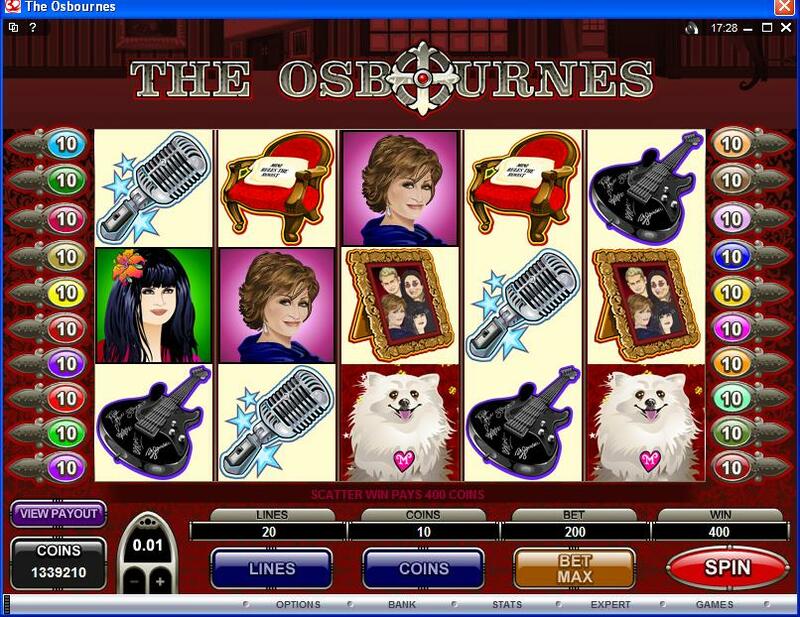 The Osbournes is a Microgaming slot machine, built under license and giving us an idea of the kind of life a rockstar’s family has. It’s also the name of an MTV reality TV series, where the star is Ozzy Osbourne, together with his wife Sharon and the kids, Kelly and Jack. It’s a slot that was built under official license, which has a lot of great features to give you and at least a decent design, though I’m not a fan of the way this part was handled. The game has its parts that are out of the ordinary, but the layout is not one of them, using a very common 5 reels with up to 20 bet lines on them. 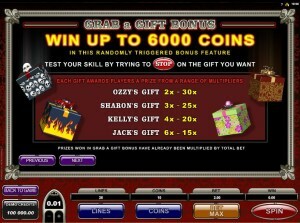 The features are a lot more fun, including a couple of bonus games, free spins, multipliers, scatters and wilds. The most impressive part of all would be the $75,000 top jackpot. 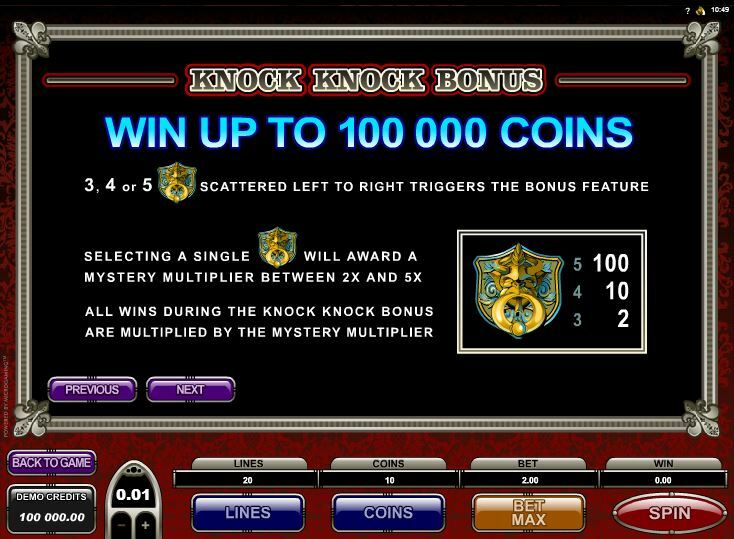 Once the reels start spinning, you will find that among the features used there are multiple scatter symbols, a wild, free spins with multipliers and two bonus games. I for one am satisfied with the variety. Sporting a very cool The Osbournes Logo on it, the wild symbol is also the one you can count on to get the biggest available prizes. 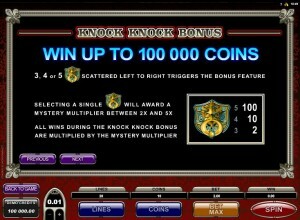 You can walk away with an impressive 15,000x jackpot, a multiplier used together with the round’s line bet. If the wild doesn’t form combinations of its own, it can at least act as your usual substitute, the role which made this feature so popular in modern slots. It can replace any of the regular symbols, though it has to first land in exactly the position where another symbol is needed. As for the scatter symbols, there are two of them present in this game, each one offering prizes as well as access to another feature. They don’t work the same way though, with the Dog scatter being able to pay from whatever random position it lands in, while the Door Knocker needs to be on reels going from left to right. They also have different prizes. The Dog scatter pays as much as 100 times the triggering bet, while the Door Knocker has a 50x upper limit. 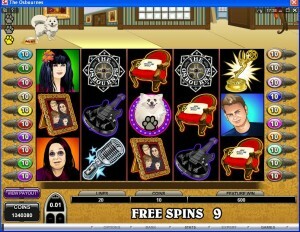 With the help of the scattered Dog symbol, you get the prizes I mentioned above, but you receive access to the free spins as well. 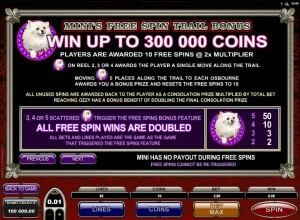 3+ Dogs on the reels will give you 10 games for free and 2x multipliers. Whenever you get a Dog scatter on one of the three middle reels, you will find that you advance on the trail by one move. 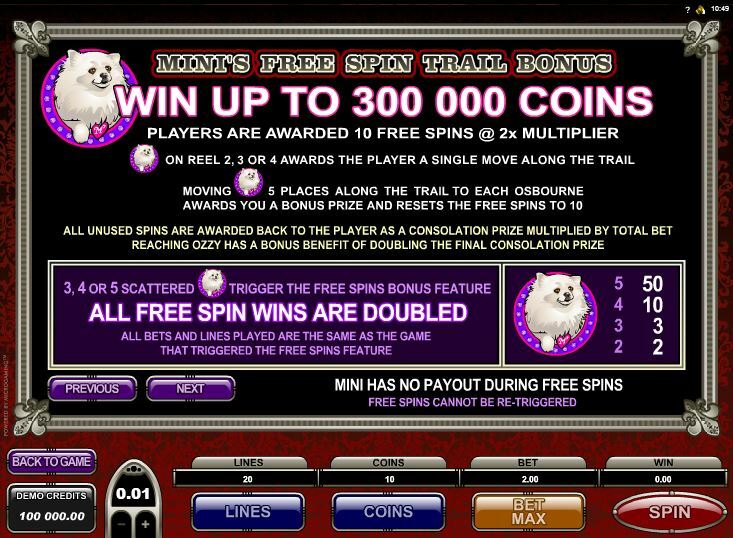 If you manage to move five spots on the free spins trail, you get another round with 10 spins and a bonus prize. The second scatter symbol is responsible for this particular feature starting up. 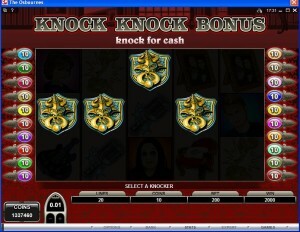 3 to 5 Door Knockers need to be arranged from left to right in order to gain access to this bonus game, but at least they don’t have to be on the same payline. You pick one of the scatters next, to find out what kind of multiplier will be applied to your bonus game wins. It can be between 2x and 5x. 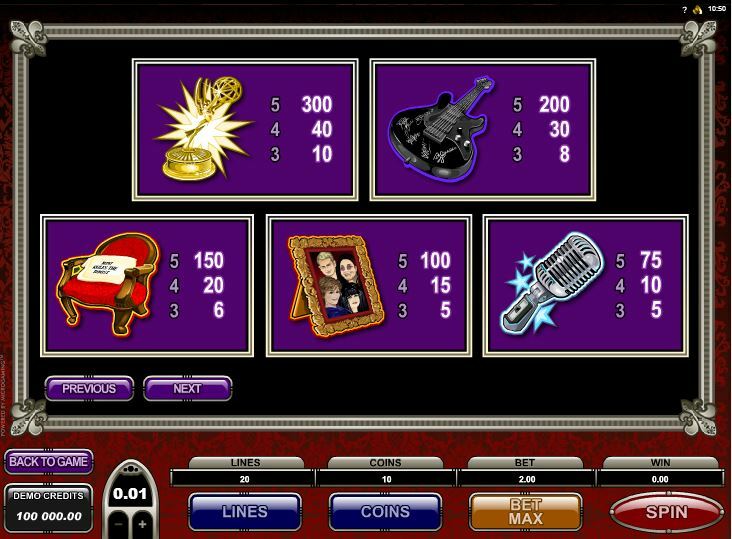 The second bonus game available in The Osbournes is triggered at random, so you don’t use any of the existing symbols to get there. It’s a bit of a skill game, where you have to click on Stop at exactly the right time, to get the gift which you prefer. 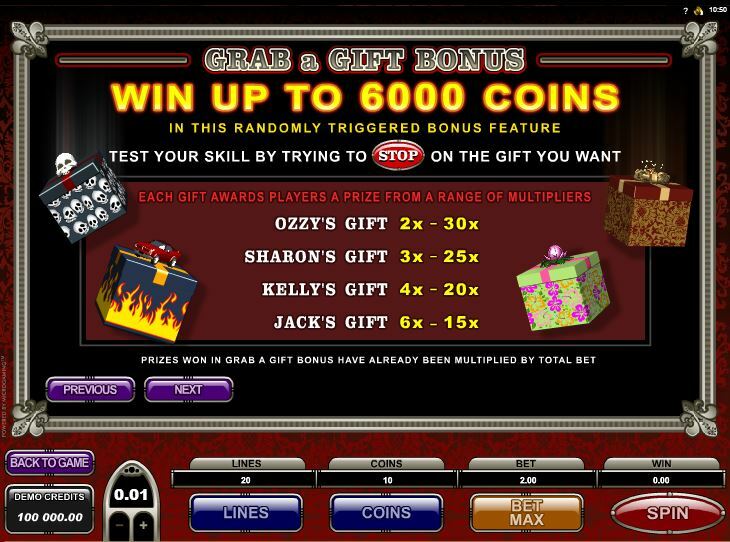 Ozzy’s Gift grants you a prize between 2x and 30x. Sharon has 3x to 25x the bet for you. Kelly’s gift has payouts of 4x to 20x. Finally, Jack’s Gift awards between 6x and 15x the triggering bet. The bets you place here can be as low as $0.01 per line, or you can go up to $5 per line, with a $100 maximum total bet. The line wagers are composed of up to 10 coins, while the coin value reaches a top value of $0.50. You get a fairly decent top prize, since at 15,000x it’s one of the bigger multipliers applied to a line bet. You win 150,000 coins this way, with $75,000 being their maximum value. The game looks decent enough, and you will have no trouble figuring out who the characters are, despite being in cartoon form. There are all sorts of other rock inspired objects among the symbols. The background picture is my least favorite part, a dark red rendering of the family’s house, which isn’t as well drawn as the symbols. Symbols: The Osbournes Logo (wild, 15,000x), Door Knocker (100x bet, scatter), Dog (50x bet, scatter), Ozzy (5,000x), Sharon (3,000x), Kelly (1,500x), Jack (1,000x), Emmy Award (300x), Guitar (200x), Chair (150x), Picture Frame (100x) and Microphone (75x). As long as you enjoy the music of Ozzy Osbourne, or at least the TV series released on MTV, I’d recommend you give it a go. The features are great, the design is average and the theme is something that you need to be a fan of before you get started. 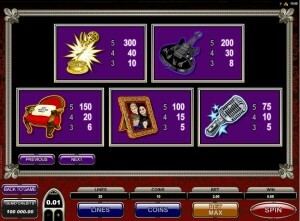 The theme of the slot comes from a reality TV program which aired on MTV between 2002 and 2005. The subject of this series was the family of the famous rocker Ozzy Osbourne. Together with his wife (Sharon), daughter (Kelly) and son (Jack), Ozzy offered a glimpse into the family life of a rock star and it proved to be quite a popular show. 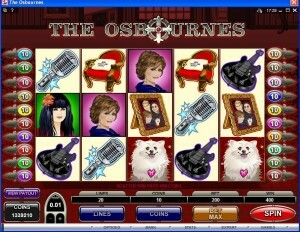 The Osbournes can be found at any Microgaming casino, where you get a chance to play it for real money or in free mode.